Also Recommended: Now and Then, Here and There; Noein; Towards the Terra. A group of enigmatic white-haired children have been spotted at different times and places in Europe for over 500 years. Always with the appearance of 11-year-olds, they behave far more mature than they should be, never grow old, and seem to have supernatural power. What they have been seeking is a girl, and the only clue they have is a picture with a crescent moon. Now, in the year of 2012, an athletic boy named Tohma is about to be involved in this centuries-long mystery. Simplicity is a good thing, I think. There is purity in it. It is also something that I cannot help but feel that much of the world of animé lacks. Trust me, I am all for complexity, but the layers of reference and self-reference that you can find if you look at even the most vapid moé show can be a little tiring to be honest. Storytelling rarely feels like a natural art in even the best shows and while it is not the be all and end all of narrative, it is a pleasant thing all the same. It is wonderful when you come across a story that feels like it grew naturally rather than being constructed. An example of this rare attribute would be a show like Now and Then, Here and There. It has a simple lead, a simple plot but a complex world that remains vivid though I watched the show years and years ago. For this very reason, it is actually pretty difficult to talk about Fantastic Children. Normally a show is hard to talk about it is because it is either so empty of content that there is almost nothing to comment on or the content is there and I just cannot stomach discussing it without a loaded pistol pointed at the roof of my mouth (something that makes both writing and speaking quite difficult). In both cases, it is a fault in the show but Fantastic Children is different. It is hard, not because there are not any interesting questions but because there are not any interesting answers. How many times can I say good before all of us get bored? How is the animation? It is good. How is the story? It is good. What about the characters? Guess what, they are good! So what can I say? What kind of show is this? Other than a good one, I think the Now and Then, Here and There comparison is fairly apt. In many ways, Fantastic Children is an adventure story. Tohma is an apparently uncomplicated child, athletic, positive and often courageous, his motivations clear and appropriate. Most of the other characters are similarly clear and precise. The drive of the story is the central mystery of the white-haired children, the show does not forget that, and the pacing on each reveal is rarely uneven. Perhaps one of the shows greatest strengths is how utterly watchable it is. If you manage to be caught up in its mystery and its characters then you will find it hard to resist watching another episode and then another. It is not utterly compelling in a thrill-ride, Death Note, manner but it is certainly not a show that I had trouble investing in. Another reason that Fantastic Children is like N&T,H&T is that it seems to completely lack a modern demographic. The simple character designs cry out that this is a show for children in a way that the content certainly does not. As much as it is an adventure show, it is also a romance, a mystery, a drama and certainly does not pull its punches in terms of often weighty and bitter emotions so it is hard to tell which fans this meant to attract. Those craving action thrills will not be sated here and those dead set on moving drama will be bored for half this show's runtime. There is no niche that Fantastic Children cultivates and so I do not think many other shows out there would suffer worse under misguided expectations than this show. If you want something specific out of this show, you will be disappointed. Talking about the art, its childish style doesn't seem to be a calculated effort like Higurashi with its juxtaposition of moé artwork and wince-inducing violence but perhaps a lesson in nostalgia, the show certainly has more in common with shows like Mysterious Cities of Gold and Galaxy Express 999 than it does with most modern genre animé. Not that it is like those shows too much but still more like them most of what came out in 2004. But yes, if you have a sensible question about the quality of an aspect of Fantastic Children, the answer is probably that it is good. Aside from the fringe cast feeling a little underused, the only damning fault that I can lay at its door is that is rarely better than good. If you're looking for a good show, however, then I can think of few more appropriate. Fantastic Children is perhaps the epitome of the term. Recommended Audience: There is violence, death and it's not altogether too happy for large portions of its runtime but nothing that should bar teenagers. 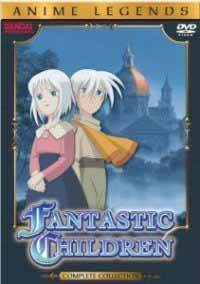 Fantastic Children © 2004 Takashi Nakamura / Nippon Animation Co., Ltd.